Elegant reception desks that are finished in Dark Oak, Cherry, Aluminium Silver or Light Oak. 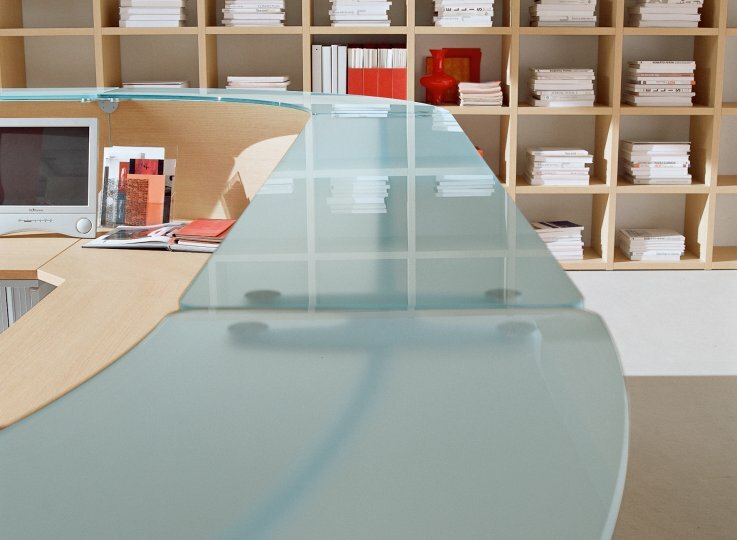 These desks are also manufactured in Italy and normally available in 3-4 weeks from order and have the option to Include satinised glass countertops to give the reception desk a further appeal. Several configuration examples can be seen in our downloadable catalogue or alternatively, you can contact our design department who will happily design a solution for you without charge. All of the Luna reception desks are compatible with the Tao range of executive credenzas and cupboards which can be found in the executive storage section of our website. When refurbishing your office, one of the most important areas that you should focus on with regards to looks is the reception area. The reason for this is that you want every person that enters your office to have a good first impression of your business before you even see them. A poor quality reception area can have an extremely negative effect on your business as this can give a negative reflection of your company and may even be the deciding factor in whether a client chooses you over a competitor. So instead of worrying about losing business, make sure that you have a reception environment that best reflects the professionalism and reputation of your company whilst giving your visitor a relaxing and comfortable wait. The Luna range of reception furniture has an elegant aesthetic appeal and is modular, meaning that a wide range of different combinations can be made to suit your needs. Ranging from straight desks with counter tops, low-level straight desks or inverted curve desks to name a few, we are sure that you will find the right reception desk configuration to suit your needs. Luna reception desks can be delivered directly from the factory, normally on a pallet, or via our professional reception desk installation service. Our trained installation teams will assemble the reception desk in its final location and remove all packaging, leaving your reception desk built and ready to use. 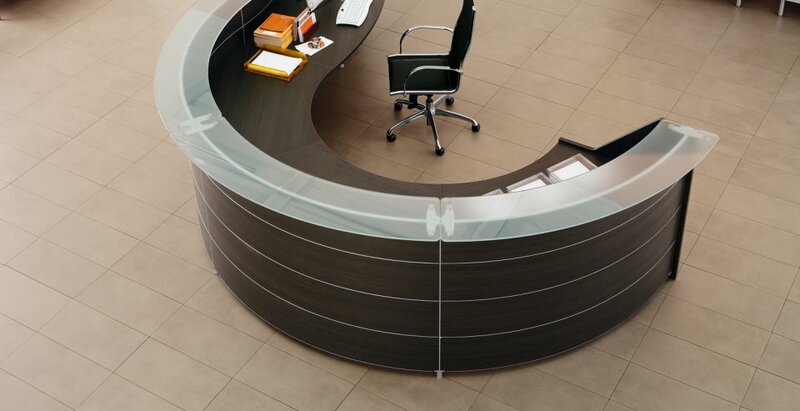 All parts of the Luna reception desk come with a 3-year manufacturers warranty as standard. Also available to you is our free design and space planning service. If you are finding it hard to work out a plan for your refurbishment, would like help with colour schemes or would like help in visualising your area, our dedicated design team are more than happy to help you. Once we know your requirements we will be able to give you 3D visuals and plans of how your reception area will look. This service is completely FREE of charge so if you would like to take advantage of this service, do not delay, call us now!